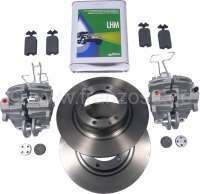 Brake system repair set front, for Citroen 2CV6, consisting in only new spareparts. This set enables to renew the complete front brake system: 2X new brake calipers, 1X brand brake discs, brand brake pads + hand brake pads and 2 liter LHM in tin can. 3x brake pipe seal.